Hymn lovers are invited to raise their voices in song at Plymouth Church in Brooklyn Heights on Tuesday nights in August. Continuing a long-standing summer tradition that began at Grace Church, Plymouth Church (through its Worship and Arts Ministry) will host Hymn Sings with the participation of several local organists. Participants will have an opportunity to choose their own personal favorite hymns, while exploring the hymn traditions of other Heights congregations and singing works by Brooklyn writers and composers. Plymouth Church has a strong heritage of hymnody. 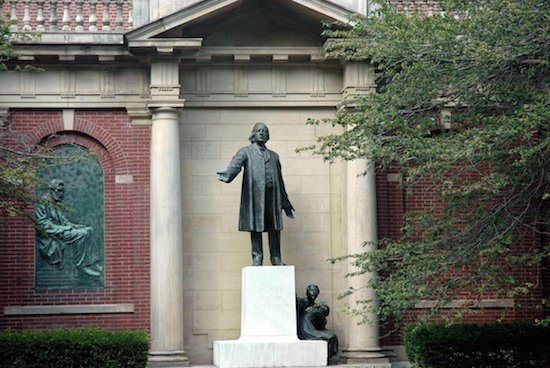 Its founder, orator and abolitionist Henry Ward Beecher, firmly believed in and wanted a “singing church.” He, his brother Charles Beecher and Plymouth organist John Zundel together created “The Plymouth Collection of Hymns and Tunes,” which was issued in 1855 and quickly spread beyond Brooklyn. They were pioneers for their time by combining words and music into one book, and placing these into the hands of the congregation. This history is chronicled at Plymouth Church’s web page, The Plymouth Collection. John Zundel composed the “Beecher” tune, named for Henry Ward Beecher. Zundel was an organist and choir director at Plymouth during the 19th century, serving there for 28 years. Today, Plymouth member Jacque Jones is president of The Hymn Society in the U.S., and a writer of hymn texts and poetry. Her hymnal titled “Songs Unchanged, Yet Ever-Changing,” published in 2014, is available through GIA Publications. She will be one of the leaders for this year’s Hymn Sings. Other Heights churches also have a share in the history of local hymnody and prominent organists. Dudley Buck (1839-1909), who arrived in New York City in 1875, served as organist of St. Ann’s Church-Brooklyn before moving three blocks north to Church of the Holy Trinity to become organist/choirmaster there, according to Orpha Ocse’s book “The History of the Organ in the United States.” The two parishes eventually merged into what is now St. Ann & the Holy Trinity Church. Buck translated into English a German text, “All That God May Give to Thee,” which is published in “Hymns and Songs for the Sunday School” (1914), according to the website resource Hymnary. Buck also composed a tune for the popular text “Through the Night of Doubt and Sorrow,” which appears in a variety of hymnals, including in the 1892 edition of the Protestant Episcopal Church’s Hymnal, adopted by that body’s general convention. Another Buck hymn is “Borthwick,” which accompanies the text “Thou knowest, Lord, the weariness and sorrow,” appearing in that same hymnal. And, according to an edition of Protestant Episcopal Church’s journal, The Churchman, published on January 14, 1922, Professor Walter Henry Hall of Columbia University, having in 1922 recently become organist at Church of the Holy Trinity (now St. Ann & the Holy Trinity), composed settings of the “Te Deum” and “Jubilate Deo.” His choir sang these works on Christmas Day, 1921. The Rev. Frederick Wooden, a former senior minister at First Unitarian Church during the 1990s until 2005, was an editor and contributor to the Unitarian Universalist Association’s (UUA) hymnal “Singing the Living Tradition” and served on the UUA Commission on Appraisal. The Hymn Sings events will convene in Plymouth’s large choir room, which is accessible via the church’s Hicks Street entrance (at the corner of Orange Street). Dates are Aug. 2, 9, 16, 23 and 30, from 7 to 8:30 p.m. Come prepared to make a joyful noise. All ages are welcome.